For over two decades, Zero has led the charge on tricks down vertigo-inducing stairs and rails. While the team may have undergone changes here and there, the Chief has proven that he has a scary eye for talent and a knack for treacherous terrain that hasn’t waned with age. Seriously, I don’t know of anybody else his age that’s throwing impossible 50-50s down no-BS hubbas or tackling 10-stair rails on an array of extremely unconventional shapes. While it’s objectively impossible to rank any Zero video over another (can any criteria accurately compare Misled Youth to, say, New Blood? ), everybody has a sentimental inkling as to which one is “the one.” Just like pretty much everybody remembers their first setup, you’re pretty much guaranteed to remember the first Zero video you saw (and probably where you were and how long you were in disbelief). For me, that rite of passage was at a buddy’s house in ninth grade when he put his Dying to Live *VHS into the cassette player and my mind exploded out of the back of my skull. 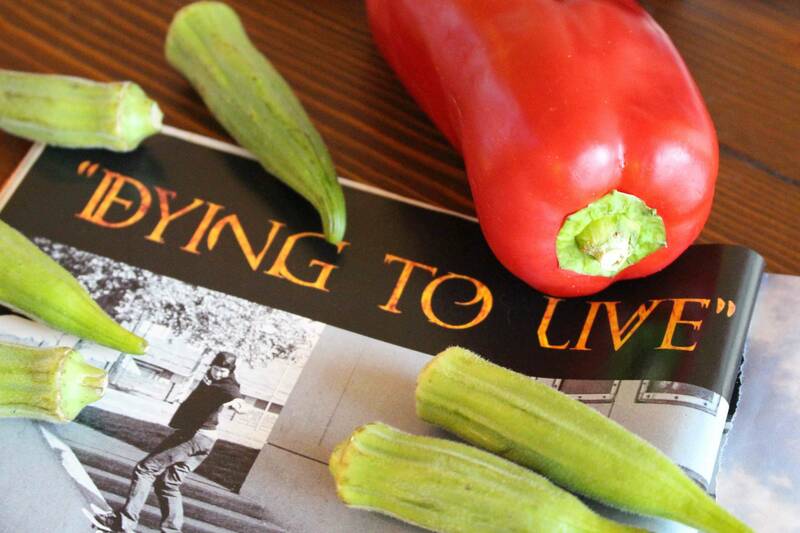 From the opening montage, set to The Who’s “Won’t Get Fooled Again,” to Rattray’s Mach 10 skating, to Chris Cole’s psychotic onslaught of destruction with Styx sweetening the package, *Dying to Live, was an unparalleled example of how far any one video could advance skateboarding. Not only did it set the bar for flipping into rails (Jon Allie did every flip to rail combo imaginable in the first 30 seconds of his part and Chris Cole is responsible for the kickflip back noseblunt heard ‘round the world), but it also provided a brilliant example of the blood, sweat, and tears that go into putting a video together by treating the audience to a slide show at the end (scored to Derek and the Dominos’ “Layla”). This gesture shows that this wasn’t just a group of skaters that were lumped together; rather, it was a family that the Chief more or less raised. Much like the Zero team has always been a paragon of the familial team, rather than a hodgepodge of riders that a team could afford, a good dish should be more than just a bunch of random foods thrown together in a sauce for a facade of harmony. A good dish should find ingredients that truly blend together in a way that not only brings out the best of all individual ingredients, but creates a stunning composite taste, as well. One of my favorite dishes that accomplishes this is stir fry. While stir fry presents a wild opportunity for abuse—i.e., throwing a bunch of random stuff in a pan and hoping the sauce will somehow bind it—this stir fry, containing okra, tofu, and bell peppers, takes the best of each flavor and then enhances each one with a spicy Thai chili sauce. Much like The Chief finds talent and builds a family like a brick house, this stir fry has both the individual ingredient power and the ensemble power to rock your plate. 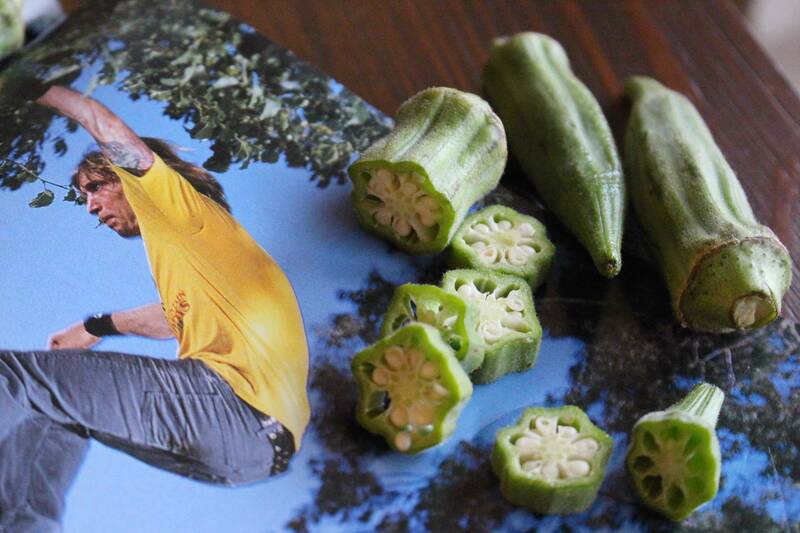 If you’ve never tried okra, don’t be deterred by its general appearance. Yes, it looks like an unholy alien device, but its sublime flavor and crunch are complemented by a nutritional profile that boasts an impressive amount of iron, fiber, calcium, and zinc. 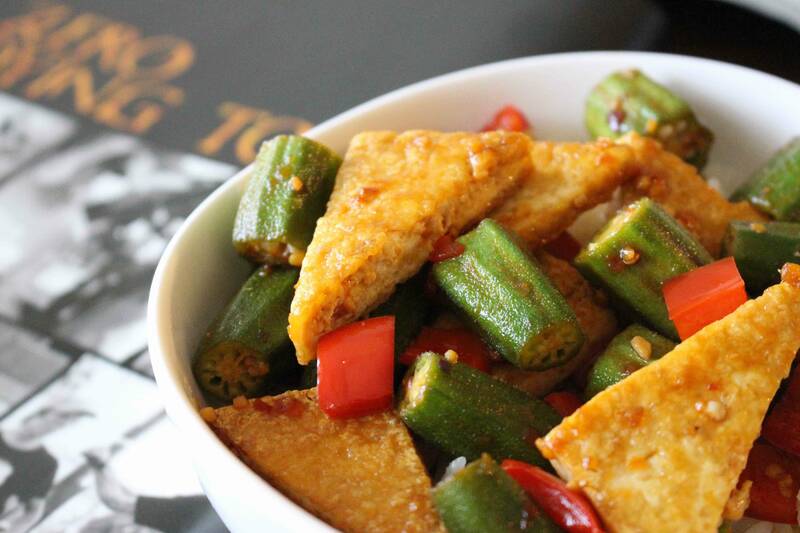 When you toss it into some chili sauce with some tofu and diced red peppers, you get a flavor that complements the other ingredients while also tempting you to pick out and savor each piece individually. 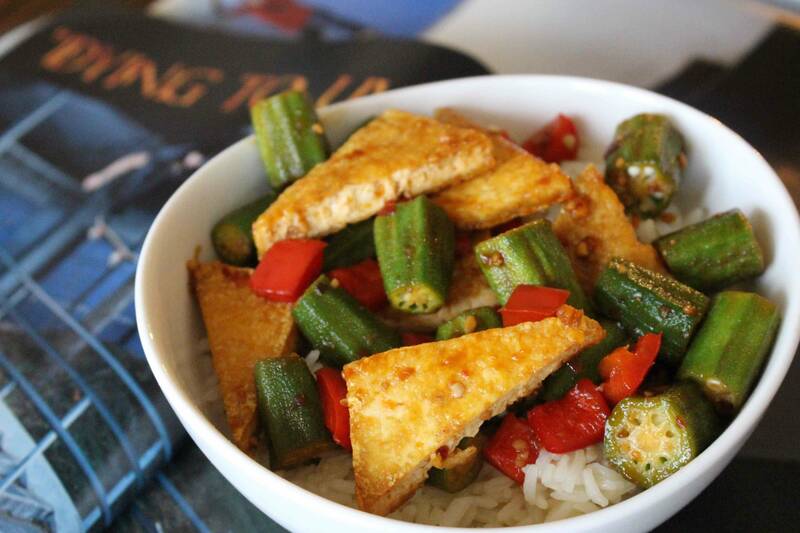 If you’ve never considered trying okra and tofu together before, this recipe will make sure you don’t get fooled again. First, press that tofu. 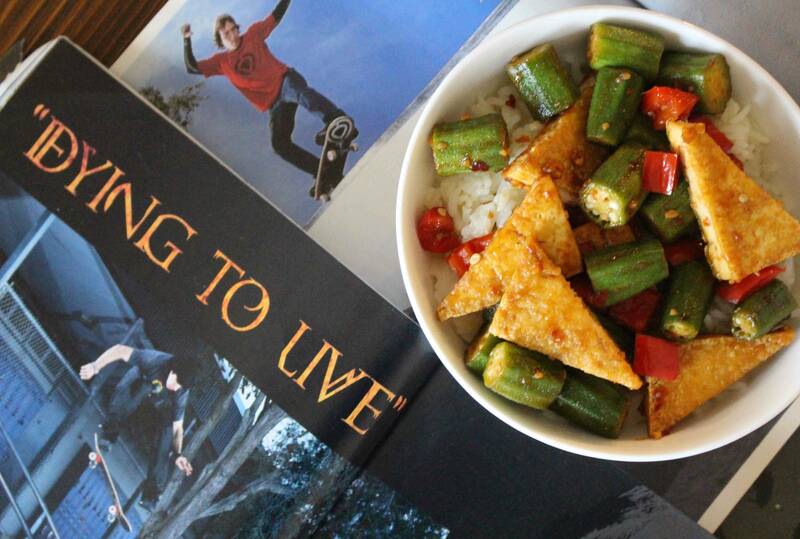 For a refresher, revisit this trick tip on “focusing” tofu. 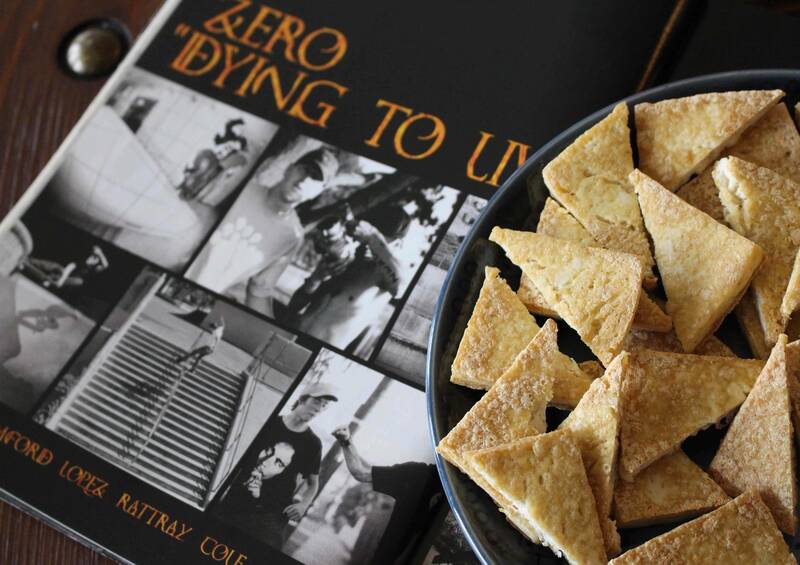 Once the tofu is pressed and drained, slice it up into squares or triangles or whatever shape you feel like eating. Bring 2 tbsp. of olive oil to medium heat on the stove and throw the tofu in the pan. Fry it for 5 minutes on each side or until it is golden brown and set it aside for later. In a small bowl, add the lime juice, soy sauce, brown sugar, chili paste and crushed red pepper and stir together to make your stir fry sauce. Set aside for later. In the same pan you used to fry the tofu, add the garlic and ginger and sauté for 30 seconds or until fragrant. Throw in the diced bell peppers and halved okra and fry for 3-4 minutes, stirring occasionally. Next throw in the sauce and stir for another 1-2 minutes. Last, add the tofu and stir for another minute. Serve on top of your rice of preference or just enjoy on its own! Plan B released a minute of Joslin park footage. Vans introduces the first-ever Women’s Transition World Championship global qualifying series.